My hubby says we tried this McFlurry last year, but for the life of me, I don’t remember that LOL I’ll say this, it DOES taste like Cadbury Crème Egg flavoured ice cream, which is awesome!! 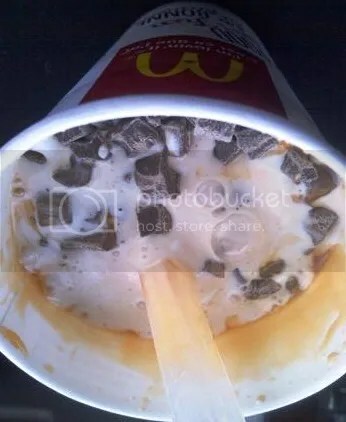 If you like the chocolate, I’m sure you’ll like this McFlurry. Be warned though, it’s almost as sweet as the Cadbury Crème Eggs themselves, which is why we probably won’t have this flavour again…was just too sweet for us. Also, make sure you get the person behind the counter, to mix it REALLY well. The person at the location we bought it at, barely mixed it, and I had to mix it by hand some more before we shared it. Mind you that’s just a complaint against the employee, and not the McFlurry itself 🙂 I guess I’m just spoiled by how well DQ’s Blizzards are mixed together LOL This particular McFlurry is here for a limited time, and I wouldn’t expect it to be around, too far past Easter. So get it while you can! !